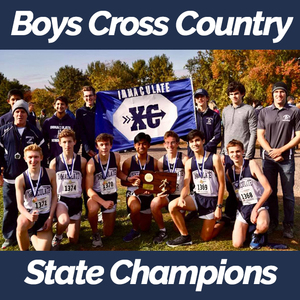 The Immaculate High School Mustangs had a tremendous Fall season, including winning the State titles for the Field Hockey and Girls and Boys Cross Country teams. Seven out of the eight Fall athletic teams qualified for State Tournaments, and the season produced three State championship wins, four State championship finalists, one Southwest Conference (SWC) Champion and two regular season Patriot Division winners. Immaculate was represented strongly in postseason play this season, creating a school record for the number of teams in a single season in the playoffs. Field Hockey won the Class S State Championship. 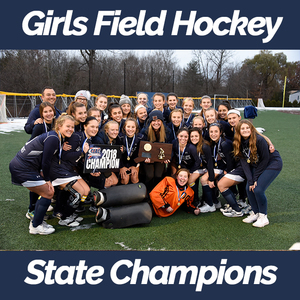 They defeated #1 seed Granby Memorial in a 3-0 shutout in the final game; this is the first time Field Hockey won the State title in school history. The girls entered the Class S Tournament as the #3 seed after finishing first in the SWC Patriot Division. After a tough loss to Pomperaug in the SWC Championship, the girls avenged their loss by capturing the State title. The team was lead by their All-State award winners Madison Halas ‘19 of Danbury, Lauren Oskam ‘20 of Ridgefield, Kristen Cirone ‘19 of Newtown and Celia Preveza ‘21 of Danbury. Celia, Madison, and Lauren also were awarded All-SWC honors as well. The Field Hockey team also had four All-Patriot Division award winners in Kristin Cirone, Molly Coyle ‘20 of Brookfield, Mackenzy Garden ‘19 of Danbury and Stephanie Faria ‘19 of New Fairfield. The team flourished under coaches Shannon Horosky and Matt Ariniello. 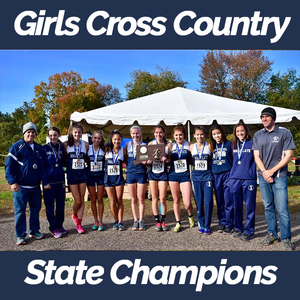 Girls Cross Country had an exceptional season finishing first in the Patriot Division and the SWC Conference Championship, winning the Class SS State Championship, becoming the State Open runner-up and finishing third at the New England Championship meet. They had six All-SWC runners, three making First Team All-SWC and three making Second Team All-SWC. The three First Team runners are Taylor Mascetta ‘19 of Danbury, Ailene Doherty ‘21 of Danbury and Kaitlyn Segreti ‘21 of Danbury and the three Second Team runners are Angela Saidman ‘19 of Bethel, Natalie Dudas ‘19 of Redding and Christina Carboni ‘19 of Danbury. Taylor, Ailene, Kaitlyn and Angela were also named CIAC All-State athletes. Boys Cross Country were Class SS State Champions, a first in school history. The team was lead by All-SWC award winner Drew Mitchell ‘20 of Brookfield as well as Honorable Mention awardees Ryan McNerney ‘20 of Sandy Hook, Parker McKenzie ‘19 of Newtown and James Sullivan ‘20 of Redding. Drew Mitchell was also named a CIAC All-State athlete. Coach Brian Hayes was awarded the United States Track and Field Cross Country Coaches Association’s Girls Cross Country Coach of the Year in the State of Connecticut. Girls Soccer ended their fantastic season 12-3-1 with an appearance in the SWC and State Championship finals, where they were runner-ups in a hard-fought States game against Old Lyme by 2-1. The team did have a tournament win 4-0 against East Granby and defeated Coginchaug 3-0 in the semifinals. The Lady Mustangs have two All-State and All-SWC players in Kayla Mingachos ‘19 of Danbury and Avery Jarboe ‘19 of Danbury, along with three All-Patriot League players in Meryl McKenna ‘21 of Brookfield, Lauren Manning ‘22 of Bridgewater and Madison Bourque ‘22 of New Fairfield. The girls have a lot to be proud of after a great season, and Coach Nelson Mingachos will be back next year in hopes of reaching the State Finals again. Boys Soccer had a fantastic postseason run after a tough start for this year’s season. The Mustangs finished 7-8-1 and qualified for the State Tournament. The Mustangs (#23), for the first time in 20 years, won their way to the State Tournament quarterfinals by winning two road games against #10 Hale Ray 2-0 and #5 St. Paul 3-1. The team was lead by the core of All-State and All-SWC award winner Quinn Guth ‘20 of Brookfield, along with All-Patriot award winners captains Michael Basile ‘19 of Bethel, Ryan Fanella ‘19 of New Milford, and David Talarico ‘19 of Danbury. The boys did a great job representing Immaculate High School and carrying on the winning culture in Immaculate Athletics under the guidance of Coach Steven Carneiro. After a losing record and missing out on the playoffs a year ago, Coach Monica Ortega and the Immaculate Volleyball Team turned the program around, qualifying for the SWC and State tournament for the first time in school history. The team finished 10-10, and also had a great State Tournament run advancing all the way to the quarterfinals, including wins against Morgan (3-2) in the first rounds of States and then St. Paul in five sets. The team was led by All-Patriot award winners Gabrielle Rynne ‘20 of Danbury and Alissa Brugnatelli ‘20 of Brewster. The team also was awarded the SWC Sportsmanship Award for the fourth time in five years. Girls Swim (a co-op with Bethel High School) also had a great season this year. The following team members competed at the State Class L Trials Championship meet: 200 Medley Relay team of Cheyanne James ‘19 of Southbury, Kristen LeFebvre ’19 of Ridgefield, Lauren Petta ’20 of Brookfield and Arianna Petta ‘22 of Brookfield, who placed 14th; Cheyanne James for the 50-Freestyle who placed 22nd and qualified for the finals, and Arianna Petta in the 100 Butterfly; Lauren Petta for the 100 Breastroke; Arianna Petta, Maya Velez ‘20 of Danbury, Kristen LeFebvre and Aislin Blair ‘19 of Danbury for the 200 Freestyle and placed 16th; and Aislin Blair, Kristen LeFebvre, Cheyanne James and Lauren Petta for the 400 Freestyle Relay and placed 17th. Besides Cheyanne James, all three relays qualified for Class L State Finals, where, Cheyanne James placed 21st in the 100 butterfly and the 200 Medley Relay team of Devin McGovern ‘21 of Brookfield, Cheyanne James, Lauren Petta and Arianna Petta placed 11th. Also, the 200 yard Freestyle Relay team of Aislin Blair, Kristen Lefebvre, Arianna Petta and Devin McGovern placed 16th, and the 400 yard freestyle Relay Team of Devin McGovern, Aislin Blair, Cheyanne James and Lauren Petta placed 17th. Congratulations to the swim team, and to Lauren Petta who broke the team and Immaculate records for the 100 Breastroke, Farrah Volpintesta (Bethel ’20) who won the Class L Diving Championship and who is the new team record holder for points scored in diving and Devin McGovern who was awarded with All-Conference Honorable Mention for her efforts this season. ATI Football, a co-op with Abbott Tech, had a strong year finishing 7-3 and just missing out on a State Tournament bid, finishing 9th in Class M. The team finished the season beating O’Brien 36-14 on Senior Day and defeating MCW United 48-6 for their Thanksgiving game. The team was lead on offense by captain Matt Christe ‘19 of Brookfield, who lead the team in touchdowns with 17 on the season. Defensively, Tommy Fahey ‘21 of Danbury finished in the top three in the State in interceptions with 10.